Witness the power and splendors of wild animals at the Jim Corbett National Park. The national park has an extraordinary range of habitats and biodiversity. Even today, elephants, deer, monkeys and peacocks roam inside the Jim Corbett as they did in the time of ancient scriptures. There are many modes to discover the wilderness of the national park. Safari in Corbett National Park is a true adventure– a journey crafted in the tradition of a wealthy man who first hunted the plains of Corbett for wild game trophies to hang on their walls. There are quite a few safari options available. Tourists can either ride on an elephant or can sit in leisure in jeep or canter to savour the wilderness in different zones. Amongst all these one of the best ways to experience the best of Corbett is via canter safari. Canter Safari is the safest mode to witness wilderness of the Corbett. The canter is a typical four-wheel vehicle. Inside the canter, 16 people can accommodate easily along with drivers which make one feel safer throughout the journey and it is less prone to animal attacks. It should be good if you will book for the 30 days prior. In case of any danger, the driver can speed up the vehicle and get out of the area in no time. If you are planning to stay overnight in Corbett Park then canter safari is the best. The Canter is booked to convey the travelers from the Ramnagar once in the morning and the second trip goes in the evening. 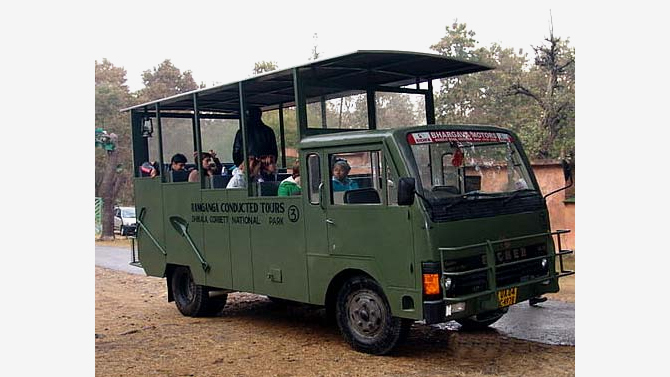 The duration of the wildlife safari at the national park is at par with other national parks in the country. Jim Corbett is amongst the well known and maintained parks in Asia. It is certainly the best place to enjoy family excursions and corporate get-togethers. Canter safari can accommodate at least 18 people at once. Hence, it is the best option for those who are planning a family or group excursions. It can be an exciting experience for corporate as well. Dhikala Zone in Jim Corbett National Park is the only region where canter safari can be enjoyed. Tourists can savour the view of exotic fauna and flora of the national park while sitting in a comfortable canter. The best about the canter safari is that an expert guide will also accompany who is familiar with the wildlife and the ware bouts of the region. Encounter legendary creatures in the wild on safari with some of the top wildlife experts. Canter safari tour is a unique extravaganza amidst in the midst of the nature’s grandeur. Tourists will have to pre-book 30 days in advance for the canter safari. Log in the official website to book for canter safari. For advance booking a photo id proof is required for both Indian and foreign Nationals. The traveller must carry the ID Proof (D Proof: DL Number, PAN Card Number, Voter ID, Passport Number, Student ID) while visiting Jim Corbett National Park. Canter safari is available at a common point (Corbett Reception, Ramnagar OR Dhangari Gate, Corbett). Safari permit is issued on the basis of first come first serve (subject to availability). E- Permits are non-refundable if permit is booked/confirmed. For the foreign tourist, canter booking should be done 90 days in advance. Passport details are required for making the reservation of foreign tourist. Tourists should have entry permits with them, which were issued at the time of online booking. The canter is a 16 seater open air bus that drives from Ramnagar to Dhikala and then back to Ramnagar. After sunset, entry is strictly prohibited inside the Jim Corbett National Park. Throughout the canter safari, one should not get down from the vehicle. No pets are allowed inside the Canter. All visitors to the Corbett Tiger Reserve are abided by the rules and regulations of wildlife protection act. Canter safari is a chance is get close to these animals in their natural habitat. It is once-in-a-lifetime experience. Outlined above are some of the canter safari futures, to help all the tourists start planning a successful Jim Corbett adventure.